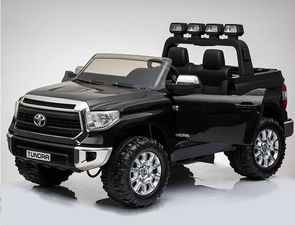 High quality 2 Seater Toyota Tundra Ride On Truck with Magic Cars® Wireless Parental R/C (remote control) system. Available in separate operating frequencies if you want to rumble, tumble, and race. This truck is huge, measures about 4 1/2 feet long with real fold down rear lift gate, and is a must have for Toyota truck lovers ages 1-10. Seats 2 children and holds up to 105 pounds. The Tundra is also great for larger children as they can take up the entire seat and still be comfortable. This real ride on truck gives you the option of remote controlling it with the included Magic Cars® wireless transmitter parental control. That's right you can operate this ride on like a huge RC car with your child in it. Drive forwards, backwards, left, and right. Or give your child full control over the steering wheel and pedals. Great feature for training new drivers as you can override the controls at anytime or press the Magic Cars® 'stop' button to stop the vehicle in its tracks! Plus you can select 3 different speeds on the Magic Cars® controller in order to limit the speed for new drivers. Oversize tires are a must on a Tundra, and guess what? You have come to the right place because the Magic Cars® RC Tundra comes with huge upgraded real rubber monster truck tires, perfect to power over dirt, grass, rocks, carpet, sand or street. Want more power? No problem as we fitted your new truck with twin high torque 12 volt motors so you get maximum power to each tire. Most cars on the market and traditional ride on vehicles at Toys R Us have (1) 6 volt motor and (1) 6 volt battery pack which is not enough power. Not your new truck so buy today and you will receive the Playtime Power Pack 24 volt battery upgrade made of 2 combined 12 volt battery packs which will give you continuous run times of 2-3 hours! That has never been seen before for cars for kids and will provide years of excitement. Buy today and you will receive the full 1 year Best In Class bumper to bumper warranty at no additional charge. That's an extra 150 dollar value for free if you buy right now. Plus, we carry all spare parts just like a full size Toyota so your new truck will literally last forever. Yes, it has driver side and passenger side real opening doors, working stereo, working headlights, rack lights, chrome wheels, memory card slots, USB hookup, MP3 hookup. real rubber tires, and a leather seat too! All children will deeply enjoy this ride on Magic Cars® Toyota Tundra truck with attention to quality manufacturing in black, red, white, or orange. Almost sold out again, please place your order today! Want more? Do not be fooled by imitators, only official Magic Cars® sold on TrendTimes.com come with the Best In Class 1 year bumper to bumper warranty for free! Arrives 98% assembled in a really big box where all the major work is done. Please order today as this car will be sold out before Christmas. Length: 53", Width: 32", Height:30"
Weight Capacity of 105 Lbs.